Carlisle Floyd, a soon-to-be 90 year-old Southern gentleman, is one of America’s preeminent operatic composers and his latest work, The Prince of Players premiered in March 2016. Oddly enough, his adaptation of Wuthering Heights, Emily Bronte’s towering novel of love and loss, made its 1958 stage début at the Santa Fé Opera but is only now getting its first commercial recording. Working with Floyd’s own setting of Bronte’s text, the opera opens with a much older Heathcliff (Kelly Markgraf) hearing the disembodied voice of his childhood sweetheart Catherine “Cathy” Earnshaw (Georgia Jarman). Eighteen years earlier, we find the couple together in the tense Earnshaw family home. Brother Hindley (Chad Shelton) is jealous of Heathcliff whom Father Earnshaw (Matthew Burns) had taken in as a poor youth. A violent argument between father and son ends with Mr. Earnshaw’s fatal heart attack, leaving Hindley in charge of Wuthering Heights. Cathy and Heathcliff spy on the Thrushcross Grange, the house of their neighbors, Edgar Linton (Vale Rideout) and his sister Isabella (Heather Buck). When Cathy twists her ankle, the Lintons insist on her recovering in their luxurious mansion. Later, Edgar comes to visit and when he makes fun of Heathcliff’s awkward manners he gets doused by Heathcliff’s cup of tea. Hindley thrashes Heathcliff and things will never be the same. Cathy gets engaged to Edgar but still longs for Heathcliff. Years later, her childhood boyfriend returns as a very wealthy man and, after beating Hindley in a card game, Heathcliff takes ownership of Wuthering Heights. Rejected by Cathy, Heathcliff decides to marry Isabella. After Cathy becomes pregnant she falls seriously ill and expresses a desire to die if she can be with Heathcliff once more. Heathcliff arrives too late to save his beloved Cathy as she dies in his arms. Maestro Joseph Mechavich leads his Milwaukee Symphony Orchestra and the choral forces of the Florentine Opera Company, one of America’s oldest such vocal organizations, in a precedent setting performance that will make listeners unfamiliar with this work sit up and take notice. Composer Floyd writes beautiful vocal lines and the cast led by stunning soprano Jarman takes full advantage of them. Vocal colleagues Markgraf, Rideout, Buck, and Shelton provide excellent support and credible recreations of their characters. Veteran mezzo-soprano Suzanne Mentzer turns in a great rendition of the old serving woman Nelly Dean. This hybrid 2-SACD set was recorded in quad (256) DSD (Direct Stream Digital) and post-produced on a Pyramix workstation at the multi-Grammy awarded Soundmirror Studio. The recording sessions took place at the Wilson Center for the Arts in Brookfield, Wisconsin where the opera was performed. In the 5.1 surround mix, there is a heightened sense of space and a very natural sound palette approaching what would be heard in an actual opera house. The orchestra is placed forward of the voices, again a realistic perspective from a live performance standpoint. The two-channel version is fine but not nearly as atmospheric. There are two separate booklets. Along with a brief synopsis, the first booklet contains performance and production credits and an extensive introduction to the opera with essays by Carlisle Floyd, Florentine Opera’s General Director William Florescu, and background pieces on the solo performers, the Florentine Opera Company, and the Soundmirror recording studio. The second booklet provides a complete libretto along with outlines of the stage business. Like Carlisle Floyd’s big hit Susannah, the star soprano gets a virtuosic monologue in Act II that sums up, with an economy of words and music, her deep feelings for Heathcliff: “Whatever our souls are made of, his and mine are the same.” This recorded première may finally set the operatic record straight regarding Wuthering Heights, particularly with a cast as good as this one. Audio values are tops and I doubt that we will get a better recording of this neglected masterpiece any time soon. Highly recommended! 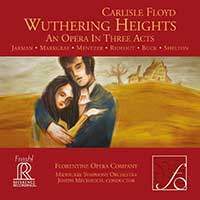 Reference Recordings gives us a definitive DSD recording on SACD of Carlisle Floyd's neglected operatic masterpiece Wuthering Heights that gets superb individual performances and musical direction.